BLM and government officials during the signing this morning. 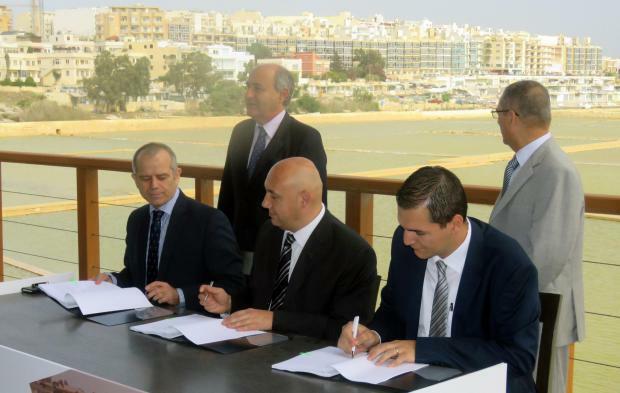 The Salini salt pans site will be managed by BirdLife Malta following an agreement signed with the government this morning. The Salina Reserve will not only be BirdLife's largest land management project but also the largest nature reserve in Malta with a history linked to salt production. "One is hopeful that the public will now be able to enjoy new bird species that are attracted to the area and maybe even breed there. The site's potential to attract birds has been proven repeatedly by birds alighting in the salt pans to rest during migration, among which the most spectacular flamingo – a bird synonymous with salt pans," BLM said in a statement. The Salini site in Burmarrad is a protected area forming part of the Natura 2000 network and was also declared a Special Area of Conservation where endemic flora and fauna can be found. The Salini salt pans were constructed by the Knights of St John in the 16th century and the site was embellished with the help of EU funds. The complex also includes three timber huts which were reconstructed on the same style of the original ones built by the British in the eighteenth century for salt production. It also includes the Ximenes Redoubt which was originally constructed in 1715/16 during the reign of Grand Master Perellos as part of the Knights’ strategy of defending the Maltese islands against invasion with a network of coastal fortifications. During the course of the 18th century the redoubt was partially converted into a salt magazine. Grand Master Ximenes added a second warehouse to the complex to increase its storage capacity. BirdLife already manages a number of natural sites that were entrusted to it by the government following the NGO's work towards habitat restoration for biodiversity in these areas. These are the Għadira Nature Reserve in Mellieħa, Simar Nature Reserve at St Paul's Bay and Foresta 2000, a large expanse of afforestation in the north of Malta. Environment Minister Josè Herrera said the government is sending out another positive signal that it believes in Malta’s environmental NGOs. He praised BirdLife Malta for proving its competence along the years in managing projects on a national scale. Infrastructure Minister Joe Mizzi said the €7 million Salina Rehabilitation Project was partially financed by the EU under the Agricultural Fund for Rural Development 2007-2013. He said the aim behind the project is to rekindle the salt production trade and to transform the site into an attraction for locals and tourists who can appreciate its potential. BirdLife Malta’s CEO Mark Sultana said the NGO will not hesitate to speak out when things are going wrong but is also ready to continue cooperating with the government so that Malta can reach its environmental targets. In a reaction, the FKNK hunters' federation said BirdLife and its allies should be grateful to the government. Soon after the 2013 election environment protection NGOs were handed an area twice the size of Comino at Xahra l-Ħamra. Following today's handover it appeared that hunting would soon also be prohibited in other areas. The federation complained that the spaces where hunting could take place were shrinking because of building, roads, buffer-zones and reserves. The Għadira and Simar sanctuaries, ir-Razzett tal-Bosk in Buskett; Foresta 2000 and l-Irdum tal-Madonna in Mellieħa; Xrobb l-Għaġin including the Deutsche Welle area, the reserve at Wied Għollieqa; zones at Għajn Tuffieħa and Ramla in Gozo, il-Ballut; Marsaxlokk Park, Il-Park tal-Majjistral and now Salini were mostly closed to the public and had been entrusted to BirdLife Malta and its allies, who have some 900 members, many of them children. Yet there were 15,000 adult registered hunters, the FKNK said.